Essex County Suicide Prevention Coalition | Mental Health Association in Essex County, Inc.
Home / Posts tagged "Essex County Suicide Prevention Coalition"
Attached please find an updated list of the available mental health awareness and suicide prevention training programs from the Essex County Suicide Prevention Coalition, the American Foundation for Suicide Prevention and the MHANYS School Mental Health Resource Center. Many programs can be delivered to your school, organization or community with little or no cost to you. 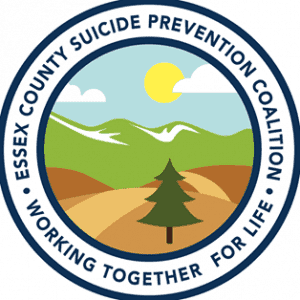 Follow the Essex County Suicide Prevention Coalition’s Facebook page for up-to-date program information and available training sessions near you. Over the next few months, you will be seeing a lot of posts about our community Out of the Darkness Walks. Why are these so important? First, they provide support and a sense of community and belonging for those who have lost someone to suicide, those who struggle and those who support the cause. Second, the money raised is needed so that we can continue to provide free local suicide prevention education and awareness programs in the 15 counties the chapter serves. We would love to have you join us at one (or more) of our 4 walks this fall but if you can’t attend, please consider making a donation. 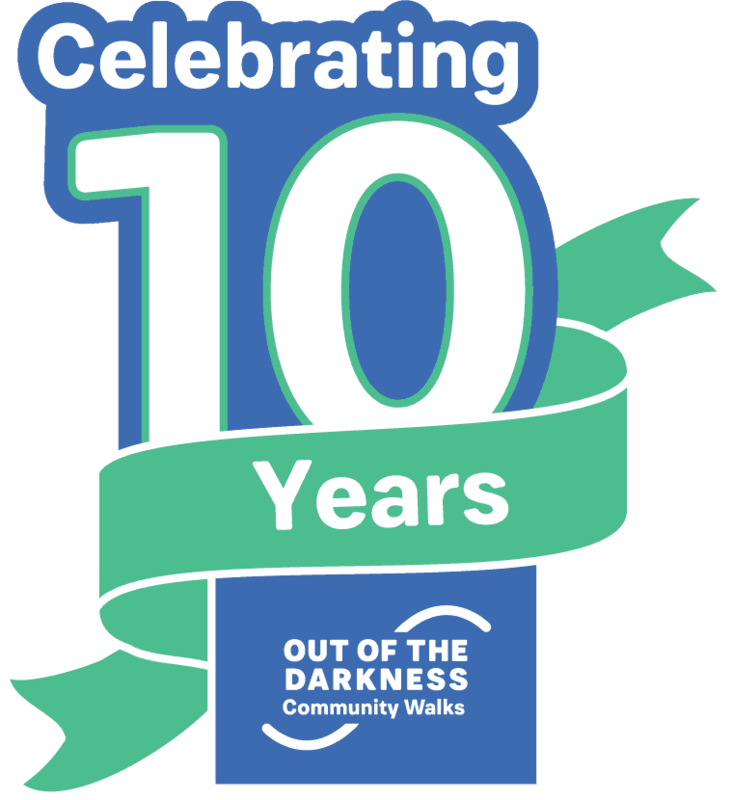 Additionally, this year marks the 10-year anniversary of the North Country Out of the Darkness Walk in Lake Placid. To register for the Walk or to make a donation, visit www.afsp.org/northcountry. For sponsorship opportunities, please review the attached sponsorship packet. There are a variety of suicide awareness, prevention, and intervention programs available for Essex County communities. Many can be brought to your community, organization or school at no charge to you. If you aren’t sure which program is right for you, contact Shelby at (518) 962-2077 ext. 101 or shelby@mhainessex.org for a training consultation. QPR – Question, Persuade and Refer – Three simple steps that anyone can learn to help save a life from suicide. Just as people trained in CPR and the Heimlich Maneuver help save thousands of lives each year, people trained in QPR learn how to recognize the warning signs of a suicide crisis and how to question, persuade and refer someone to help. QPR can be learned in as little as one hour. esuicideTALK – esuicideTALK is a 1-2 hour online awareness session that helps participants reduce stigma and become more aware of suicide prevention opportunties in their communities. suicideTALK – suicideTALK is a 90-minute to half day session that helps participants, regardless of prior training or experience, be more aware of suicide prevention opportunities in their communities. Dealing openly with the stigma around suicide, this exploration focuses upon the question “Should we talk about suicide?” By looking at this question in a number of different ways, session members can discover some of the beliefs and ideas about suicide in their communities – and in themselves. safeTALK – SafeTALK is a three-hour training that prepares anyone over the age of 15, regardless of prior experience or training, to become a suicide-alert helper. Most people with thoughts of suicide don’t truly want to die, but are struggling with the pain in their lives. Through their words and actions, they invite help to stay alive. safeTALK-trained helpers can recognize these invitations and take action by connecting them with life-saving intervention resources. Mental Health First Aid – Mental Health First Aid is an 8-hour course that teaches you how to identify, understand and respond to signs of mental illnesses and substance use disorders. The training gives you the skills you need to reach out and provide initial help and support to someone who may be developing a mental health or substance use problem or experiencing a crisis. Curriculums are offered for Adults, Youth, Higher Education, Public Safety and CIT, Military Members, Veterans and their Families, and Older Adults. Talk Saves Lives: An Introduction to Suicide Prevention. A community-based presentation that covers the general scope of suicide, the research on prevention, and what people can do to fight suicide. Attendees will learn the risk and warning signs of suicide, and how together, to help prevent it. It’s Real: College Students and Mental Health. It’s Real is a documentary featuring the stories of six college students from across the country. 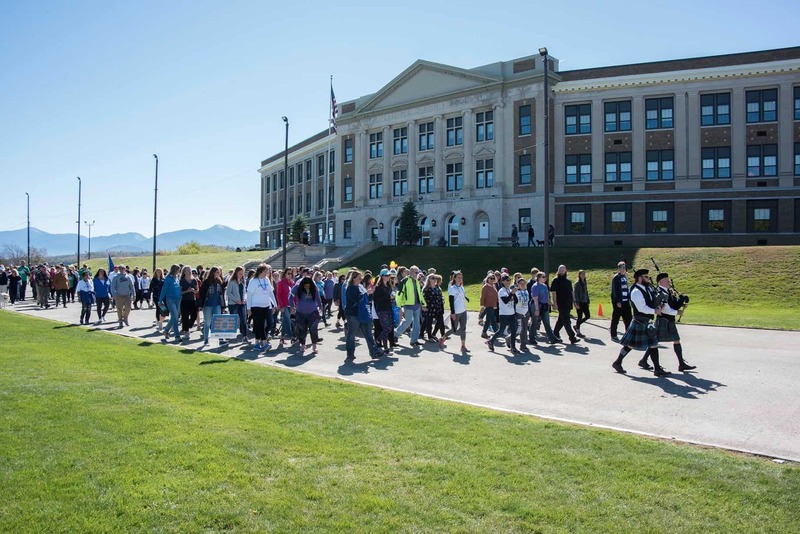 The film is designed to raise awareness about mental health issues commonly experienced by students, and is intended to be used as part of a school’s educational program to encourage help-seeking. More than Sad: This program teaches teens to recognize the signs of depression in themselves and others, challenges the stigma surrounding depression, and demystifies the treatment process. It teaches parents how to recognize signs of depression and other mental health problems, initiate a conversation about mental health with their child, and get help. It teaches educators to recognize signs of mental health distress in students and refer them for help. The program complies with the requirements for teacher education suicide prevention training in many states. Lifelines: A Suicide Prevention Program. Lifelines is a trilogy of programs based on over 20 years of suicide-in-youth research that indicates an informed community can help to prevent vulnerable teens from ending their lives. This whole school program is made up of three unique components: Prevention, Intervention and Postvention. Training includes curriculum for school administrators, faculty, students and parents. Training programs are sponsored by the Essex County Suicide Prevention Coalition and the American Foundation for Suicide Prevention. 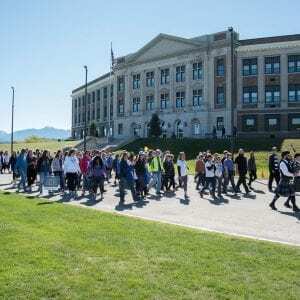 After a Suicide: A Toolkit for Schools assists schools in implementing a coordinated response to the suicide death of a student. Originally developed in 2011, the second edition includes new information and tools that middle and high schools can use to help the school community cope and reduce suicide risk. The toolkit was developed in collaboration with the American Foundation for Suicide Prevention and in consultation with national experts, including school-based administrators and staff, clinicians, researchers, and crisis response professionals. It is designed primarily for administrators and staff but can also be useful for parents and communities. Link to the toolkit HERE. If you or someone you know may be having thoughts of suicide, call the National Suicide Prevention Lifeline 24/7 at 800-273-TALK. To reach someone to talk to in Essex County, call the 24-hour Essex County Mental Health Services Crisis Line at 888-854-3773 or the Mental Health Association 24-hour Hopeline at 800-440-8074. Free and confidental emotional support is always available. With help, comes hope. My husband Dennis Ryan was bigger than life. Very much a people person, he always empathized with people who were going through hard times. He was kind, had lots of energy, and was known for being intense. With these qualities, he helped to move the world around him in positive ways and led the many projects he worked on to speedy completion. Whether driving miles to the funeral of a good friend’s parent or involving himself in community affairs, Dennis was always present for others. Dennis was the love of my life. He was a gentle soul with a huge heart. Perhaps his heart was bigger than the average one, and that is why he gave so much of it to others. He loved his family and me more than himself. He loved his friends, as they were his family too. His passions were many and one of his primary ones was being involved with the lives of others. He was a good listener. When he would talk with you, you felt like you were very special, as if you were the only one in the room. He was a small town guy, but he drew in a city of friends as well. His famous quote was, “Failure was not an option.” He was a Norwich University graduate and a very disciplined individual who had great respect for the Military life in general. His father was a Pearl Harbor survivor and my father was an 82nd Airborne soldier, surviving all the major campaigns during World War II. As a result, Dennis was deeply involved with the Veterans’ causes throughout his life and right up until his death. He was a man who was always full of surprises and especially loved the simple things in life. A major passion was his love of music. As a result, he spent the majority of his professional life in the radio business. He started out as a disc jockey in college and finally his experiences grew into management and ownership. He loved movies and holding hands, chocolate and red wine, and especially our Christmas Eve’s together. He was a big fan of the holidays in general and participated in the Fourth of July, even becoming a licensed pyrotechnic and he set off many fireworks over the years. He enjoyed flying and was a licensed pilot who flew whenever he could. He worked with NASCAR for a time, and Help Wanted.com, and finally as the financial business consultant. A funny story about my guy to end on….One time at Thanksgiving, the restaurant was out of pumpkin pie, which is my favorite kind. So the next year, he actually brought a pumpkin pie to the very restaurant we had been going to for years, just so I could have my favorite pie for dessert, should they be momentarily out, and never be disappointed. He became the “pumpkin pie guy” at the restaurant forevermore! He loved his 1976 Eldorado Cadillac so much and called it Big Red and took such wonderful care of it, just like he did with me. Our Sundays were mostly spent on taking road trips in Big Red with the top down as we just cruised the back country roads. This made my guy smile a lot. He used to walk in our door bellowing, “Honey, I’m Home,” after Jackie Gleason of the Honeymooners, one of his favorite shows growing up. He loved bells and even hung a big bell at work and each time he’d come in the door, he would ring it and say the same thing: “Honey, I’m Home.” The girls at the office all loved him too. My guy is still inside my heart, where he will forever remain. After the shock of his death by suicide on May 21, 2012 — a suicide no one saw coming — I fell into deep sadness, then depression. Looking back, I don’t know how I would have survived without the love and support of my family and friends. Mine was a very slow recovery amidst the chaos of financial matters, moving from the cozy house we had shared and the city we had both loved, and dealing with endless details alone. My long-time love of writing poetry helped me to find a new way of living my life. It provided me with a means for dealing with my extreme loss when I was alone and distraught. The poems started to come to me soon after the suicide and continue to do so often. I don’t think this will ever cease. Eventually, I began to think that perhaps I too could find a way to help others, with my poetry. The aftermath of a suicide is a long dark tunnel to walk through for those left behind. Extreme effort is required to get through each day, especially at the beginning. I have learned that the stages of grief that psychology and self-help books outline are unpredictable and ever-present in my life. There is no exact science of the grieving and healing processes. It is easy to slip back into the sadness of loss, especially at anniversaries and holidays. Each person grieves in their own special way. I have been so fortunate to have the ongoing support of my family and friends. My wish is that, in some small way, my poetry will touch others in situations similar to mine. I want others to realize that it is possible to make it from the darkness of despair back into the light of hope. My book of poems is also a call to those dealing with suicidal thoughts in their daily lives. Death by suicide is not the answer. Reading the thoughts of someone left behind may make it possible you to grasp that there can be another way. Talk to someone. If that doesn’t work, talk to someone else. Because your life matters and there is help for you out here. I have lived and let go of a lot of pain. Firmly embedded in the deep white snow. My heart is feeling more at peace. Beckoned me back to life. With not a second to waste. If you or someone you know may be having thoughts of suicide, call the National Suicide Prevention Lifeline 24/7 at 800-273-TALK (8255.) To reach someone in Essex County, call the Essex County Mental Health Clinic Crisis line 24/7 at 888-854-3773 or the Mental Health Association’s 24-hour Hopeline at 800-440-8074. Free and confidential emotional support is available, and with help, comes hope. Seven years ago, I attended my first North Country Out of the Darkness Walk. I was only nine months out from a suicide attempt that gave me three days in the ICU and then seven more on the mental health unit. I was still finding my footing in accepting my diagnosis of bipolar disorder – a diagnosis I received as a teenager, but did not embrace as part of me until my early twenties. A select few people in my life knew about my attempt, but I was not comfortable sharing that part of me with most people. I still felt the shame and stigma surrounding my illness that I had felt for years, the same shame that had caused me to hide years of self-harm, medications, ER visits and short admissions to the hospital. I came to that first walk with my mother, and I remember us tearfully leaning into each other while listening to the words of the survivors of suicide loss. We didn’t speak, but we were both thinking the same thing – how close I came to being a name on a sign instead of standing there, absorbing the pain and loss of those left behind. Those first few walks, those early years in my mental health recovery, were about reminding myself that I was still here, and how close I came to the alternative. I began to speak openly both about having bipolar disorder, and about attempting suicide. Instead of the judgment and stigma I expected I was met with support, encouragement and most surprisingly – gratitude. The more I spoke about it, the more other people felt comfortable reaching out and sharing their own stories of struggling with their mental health. It took work – and I want to emphasize that – to obtain stability, and then to maintain it. It took trying different medications until we found the combination that worked. It took working with some providers I loved, and some that I didn’t, to find treatment that worked for me. There are many kinds of mental illness. Bipolar disorder is a lifelong diagnosis and for me, recovery is an active choice. I will always be in recovery, I will never be recovered. I have to practice self-care, have a strong support system, and recognize when I am starting to feel unwell. But with all of this work I am able to maintain a life that I love. I am a mother to three beautiful boys – my three and a half year old, and my 15-month-old twins. I also have a career that I am passionate about that brings me the purpose I have always desired. Do you know what I do? I am a wounded healer. I began my career in mental health two years ago, and this past summer I became a New York State Certified Peer Specialist. A peer is someone who uses lived experience to help others with their mental health recovery. I specifically work in crisis stabilization – helping people who are actively suicidal or are experiencing suicidal ideation. I also help people as they are being discharged from an inpatient hospital stay and connect them to services to assist in their recovery. The same types of services that helped me. My own experiences allow me to have true empathy for the people I am trying to help. I asked to speak here today because I know there are a lot of people out there wearing green beads who could benefit from a message of hope. I want you to know, from someone who has been at that lowest low, that you won’t always feel that way. And one thing to take away from being here – that I always take away – is that there are people who love you who need you here. And even if you feel like there aren’t, you never know who you will meet tomorrow, or next month, or next year. I met my husband six months after my attempt. There are three little boys here today who might not have existed because of how I felt for a short time eight years ago. If you are feeling suicidal, please reach out – whether it’s to someone in your life that you are close to, a medical or behavioral provider, or a hotline, warmline or helpline. There are people out there who care. You matter. There are professionals here today who can provide you with resources and phone numbers, or if you don’t have access to those numbers in a crisis or can’t remember, dialing 2-1-1 can help connect you to local resources as well. There is a quote I go back time and again when I am feeling low or working with someone who is feeling suicidal. “No feeling is final”. Trust me when I say it’s worth it to see how the future feels. Click here to download a PDF of Hillary’s speech. 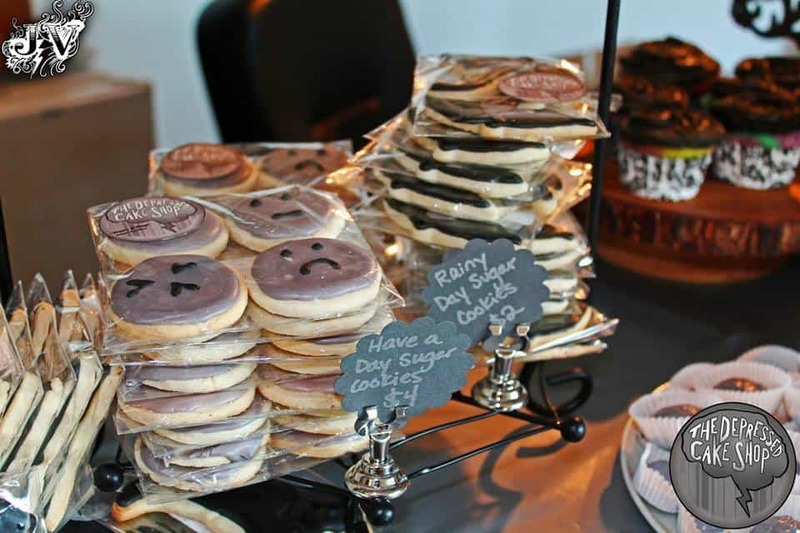 The Depressed Cake Shop is a world-wide movement in experiential public relations. Specifically, Depressed Cake Shop is a pop-up bake shop, comprised of gorgeous baked goods decorated in various shades of grey, sometimes with a pop of color to represent hope. The grey symbolizes the grey cloud that can descend over a beautiful world when someone is struggling with mental health conditions. The pop of color signifies hope, the hope we all have, the hope we lend to someone who is in need. Depressed Cake Shop is a stunning visual reminder of mental illness and is meant to get people thinking and talking about the subject in a new way. 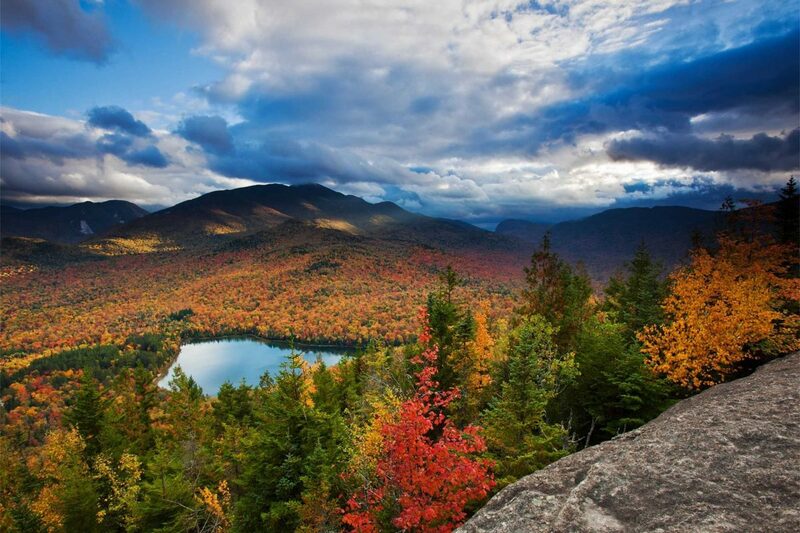 It’s a perfect fit for the North Country Out of the Darkness Walk in Lake Placid, and organizers hope that the creativity will astound participants at the Olympic Oval on Sunday, October 1. 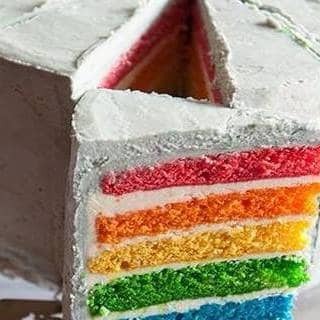 Bakeries interested in donating baked goods may contact Amy Quinn at anq1970@gmail.com. 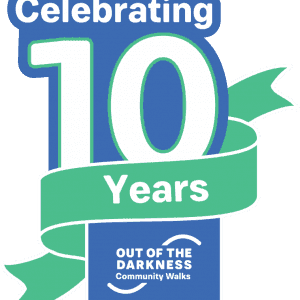 To register for the North Country Out of the Darkness Walk, visit www.afsp.org/northcountry. To make a raffle donation or for information about sponsorship, contact Shelby Davis at Shelby@mhainessex.org or call 518-962-2077 ext. 229. 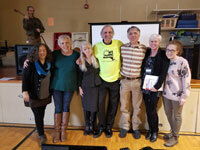 Essex County Residents now certified in Mental Health First Aid! Congratulations to the newest group of Essex County residents certified in Mental Health First Aid! With the gorgeous backdrop of the lake as the view, they spent all day yesterday in Lake Placid learning about common mental health disorders, signs and symptoms, risk factors, how to recognize a mental health crisis, and what to do to assist a person experiencing a crisis until the situation can be deescalated and how to refer to appropriate treatment. For more information about Mental Health First Aid, visit mentalhealthfirstaid.org. 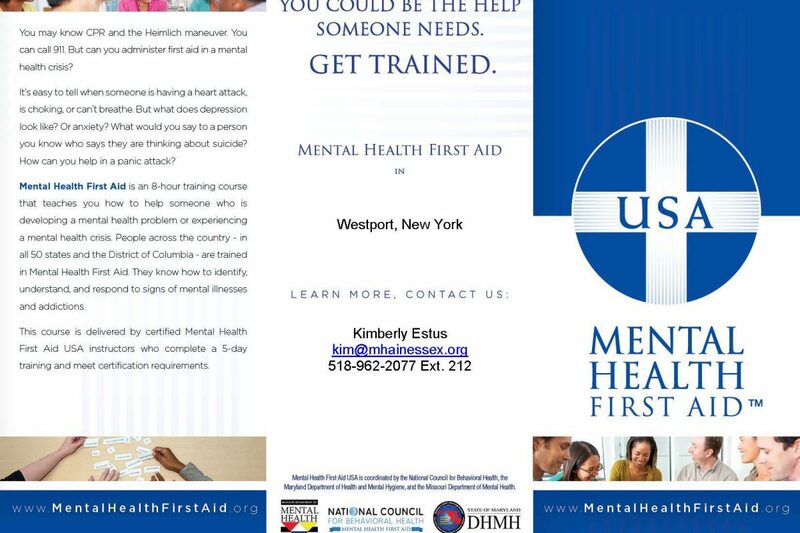 Mental Health First Aid training, along with other mental health and suicide prevention training, is brought to Essex County by a grant through Senator Betty Little‘s office. Without these generous grant funds, the Coalition would not be able to provide community education, outreach, and many other services. Many thanks to Senator Little for making suicide prevention and mental health a priority. One of the services provided by the Essex County Suicide Prevention Coalition includes postvention response. Postvention is a term often used in the suicide prevention field. The definition below is from the U.S. national guidelines developed by the Survivors of Suicide Loss Task Force. To contact the Coalition about postvention services, support for family members, co-workers, or friends or others who may be grieving, call the Hopeline at 800-440-8074 or make an online referral here https://mhainessex.wufoo.com/forms/mobile-crisis-referral/. If you or someone you know might be having thoughts of suicide, call the National Suicide Lifeline at 800-273-TALK (8255), Essex County Mental Health Crisis line at 888-854-3773 or the MHA Hopeline at 800-440-8074. All lines are 24/7, free and confidential.